Incorporating the accidental, the indeterminate effect, has a long and familiar history in twentieth century art practice: from Duchamp to Cage to Fluxus, and so on. Following on from Cage’s fascination with chance and the I Ching, consulting an oracle became a domesticated methodology for Brian Eno and Peter Schmidt with their Oblique Strategies (1975) set of cards, in which randomly selected cards were intended to offer a strategic route out of creative deadlock. Were it not such a pompously worded piece of pseudo crypticism, one of the instructions to “honour thy error as a hidden intention” could almost be a motto for the glitch practitioner. However glitch as a phenomenon and a genre moves beyond honouring error, rather it mobilizes error, indeterminacy becomes failure, which becomes instrumental. The efficacy of error and failure provides a methodological basis materially integrated with media technology, which is understood in the last fifteen years or so to be digital media. Glitch has helped to introduce the notion of materiality to digital media-based art forms, what I have characterised as a digital materialist practice, not without some irony for a media technology usually understood to be lacking physicality. Alas subsequent versions of the software simply refuse to recognize sound files at all. I went on to experiment with combinations of sound as image, image as sound, parsing both as text, back to image, and so on. The manifestations of the mutability of the media through digital noise that were outcomes of the processes were incorporated in a number of my video works such as Sevenths Synthesis, Local Authority (both 2001) and Metalogue (2003). The wilful incorporation of digital materialist mutated media is very much part of the impulse to glitch, as it symbolises and demonstrates the material substratum of a medium designed to remain transparent. My particular interest was in this question of materiality, which I related to the materialism of an earlier experimental film practice. The paradoxical question of the apparent lack of digital physicality and indexicality, was interesting and problematic. The conditions that make such materialist explorations possible result from the subversion of the normal functions of the digital apparatus, whether this is ‘actual’ physical material becomes a moot point, there is (symbolic or otherwise) representation of the materiality of the media, revealed through that which is in excess to its transparency, through the production of artefactual objects. What precedents were there for this in electronic media? A materialist film practice (‘materialist’ both physically and dialectically) was well-established, but in the nineties there was little precedent in digital moving image, it was a ‘new media’. Analogue electronic media-based art tended to be concerned primarily with video as semiotic and pragmatic, while some artists such as Peter Donebauer and Steina & Woody Vasulka, were concerned with abstract synthetic electronic properties. But with the exception of the Vasulkas in works such as Noisefields and Soundgated Images (both 1974), and work made at the Experimental TV Centre in New York, few seemed to have explored the possibilities and implications of material mutability of the electronic signal beyond its manifestation as mystic symbolism or psychedelic immersive properties. 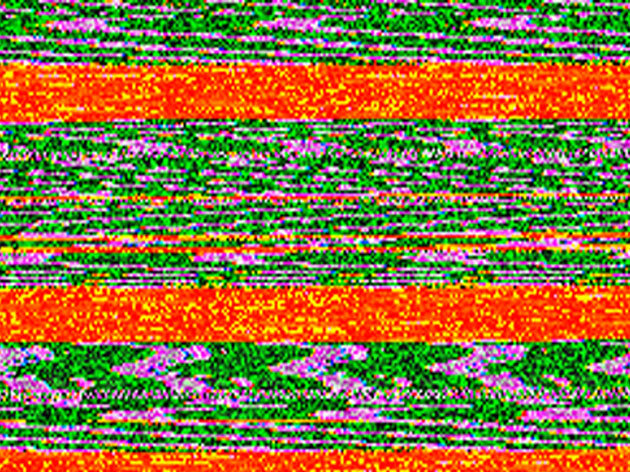 Later Malcolm Le Grice’s Digital Still Life (1986) and Arbitrary Logic (1989) explored more programmatic relationships between digital sound and image. There was however a much more concerted and identifiable practice developing in music. Yasunao Tone had been involved with Fluxus and very much in the milieu of conceptual indeterminate operations, produced works such as Musica Iconologos (1993) which ‘translates’ digital images of characters into sound, http://lovely.com/soundfiles/452953041_1.mp3 and Symphony for Wounded CD (1997) which consists literally of the sound glitches produced by a damaged compact disc. Glitch became the aesthetic language of the ‘clicks and cuts’ musicians, in a computer-based development of the circuit bending practices of the post-punk DIY scene, popularized in the late nineties by the likes of Oval, Autechre, Aphex Twin, etc. 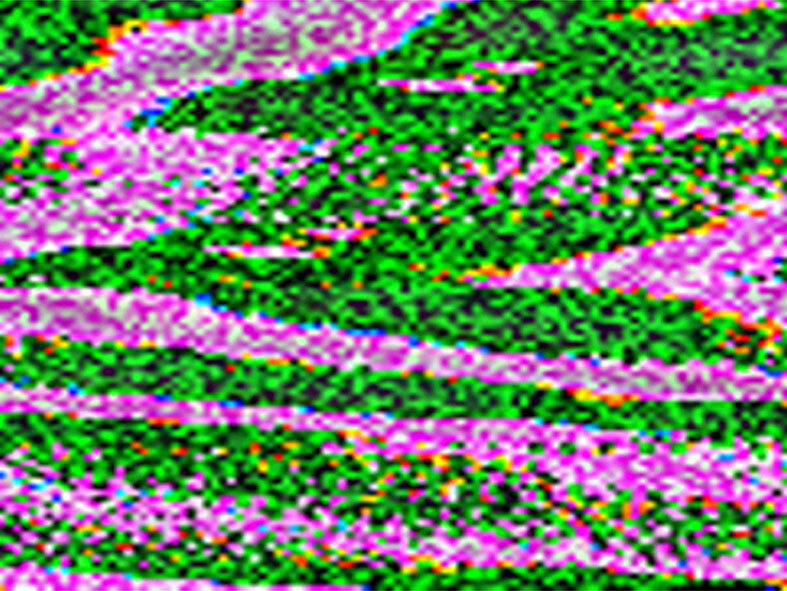 Parallel to this early net art pioneers jodi were exploring the aesthetics and mutability of raw code out of control, wreaking uncontrollable havoc in your browser window. Around the turn of the century a number of video makers started to embrace the glitch noise imperative, such as Dutch Austrian duo reMI and Bas van Koolwijk. Much of this work is realized in collaboration and in performance. The harsh noise and busy flickering digital abstraction suggested a new formalism without the idealism of modernism, new possibilities emanated from the heart of the code itself, while the visceral experience of viewing and hearing was similar to the post-individualist dissonant jouissance of noise music. However there seemed to me to be little potential for the form beyond ever more intensified neo-psychedelic immersion. Notwithstanding attempts at formalizing the practice in events such as Abstraction Now, Vienna, 2003 or Simon Yuill’s interesting theorizing of digital materialism as analogous to modernist architecture as Code Art Brutalism, the law of diminishing returns starts to either up the ante or reduce the effectiveness through familiarity, and innovative technique shaded into predictable trope. 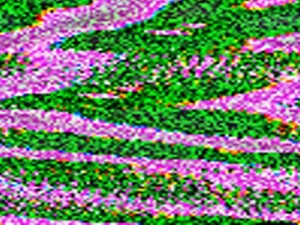 My last glitch-inflected digital video was The War on Television (2004), which intended to explore/expose the mutability of the then newly ubiquitous televisual digital media as a dialectical opposition to media transparency, both in terms of the ostensible quality of the interference-free image that digital TV claimed to provide, and the authority of the news it now carried twenty four hours a day. By 2004 digital materialism was no longer enough in itself, for me there was an imperative for it reflect a position in relation to the political and cultural effects of what was happening with the media, in the media, in the world. whose 2008 Extensity Of Hard Disk Drive leaves data behind altogether to pay attention to the physical materiality of the hard drive itself? 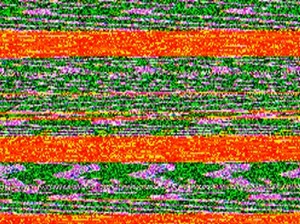 However Rosa Menkman has now revivified the practice, published her Glitch Studies Manifesto, and is rigourously collecting data and theorizing the phenomenon in a way that’s not so far been done. This has suggested to me a new traction for glitch, digital materiality and medium specificity and in future posts I intend to explore and expand on this, speculating on their renewed currency, efficacy and implications across contemporary practice, and perhaps beyond. This entry was posted on Monday, February 21st, 2011 at 11:32 am and is filed under ACCELERATION. You can follow any responses to this entry through the RSS 2.0 feed. You can leave a response, or trackback from your own site.